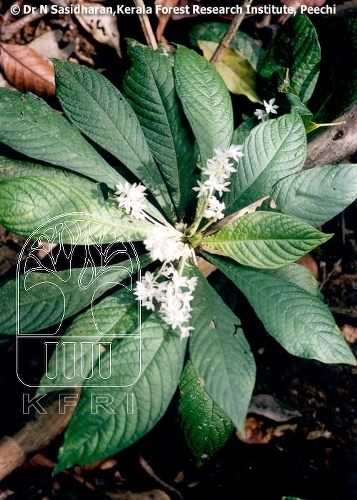 Citation: Neurocalyx calycinus (R. Br. ex Bennett) Robins., Proc. Amer. Acad. Arts 45:402. 1910; Mohanan, Fl. Quilon Dist. 215. 1984; Manilal, Fl. Silent Valley 138. 1988; Ramach. & V.J. Nair, Fl. Cannanore Dist. 228. 1988; Vajr., Fl. Palghat Dist. 238. 1990; M. Mohanan & Henry, Fl. Thiruvanthapuram 239. 1994; Subram., Fl. Thenmala Div. 163. 1995; Sasidh. et al., Bot. Stud. Med. Pl. Kerala 33. 1996; Sasidh., Fl. Shenduruny WLS 161. 1997; Sivar. & Mathew, Fl. Nilambur 341. 1997; Sasidh., Fl. Periyar Tiger Reserve 182. 1998; Sasidh., Fl. Parambikulam WLS 156. 2002; Mohanan & Sivad., Fl. Agasthyamala 339. 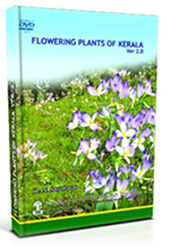 2002; Anil Kumar et al., Fl. Pathanamthitta 260. 2005; Ratheesh Narayanan, Fl. Stud. Wayanad Dist. 432. 2009. Argostemma calycinum R. Br. ex Bennett, Pl. Jav. Rar. 97. 1838. Neurocalyx wightii Arn., Ann. Nat. Hist. ser. 1. 3: 22. 1839; Hook. f., Fl. Brit. India 3: 47. 1880; Gamble, Fl. Pres. Madras 591(417). 1921. Description: Large herbs, pubescent. Leaves simple, whorled at tip, 26 x 7 cm, oblanceolate, acute at apex, rusty puberulus; nerves to 18 pairs, prominent below; stipule 2 cm long, obovate, 2-fid at apex. Racemes 10-13 cm long, axillary, rarely branched; bracts lanceolate. Flowers white, pedicelled. Calyx tube hemispherical, lobes 5, 8 x 5 mm, ovate. Corolla tube absent, lobes 5 x 3 mm, ovate, twisted. Stamens 5, anthers connate into a conical tube. Ovary 2-celled, ovules many, style slender. Capsule irregularly bursting, 4 x 4 mm; seeds many, pitted.